Brian Benavidez (left) poses with teammates Arron Bellini and Kamil Agrawala after winning the People’s Choice Award at the Engineering Expo. Brian Benavidez did not expect to have a chance to go to college since he had enlisted in the U.S. Air Force immediately after graduating from high school. But it was the experience in the military that gave him focus and direction that he credits for his success in school. And the scholarship support he received from the School of Electrical Engineering and Computer Science inspired his desire to give back. Benavidez spent four years in the Air Force including a deployment to Iraq. Most of his enlistment time was in Arizona where he was maintainer for F16s which included working on avionics systems like navigation, fire control, and flight control computers. “I’ve always been a tinkerer, but that experience really opened up that horizon of electronics and engineering,” he said. Meanwhile many of his buddies from his high school in Portland went to Oregon State University, and he started to realize he was missing out on the college experience. Through the Enlisted Commissioning Program he was able to come to Oregon State as an Air Force ROTC cadet. “When I first got here I was in shock and intimidated, but as time went on I got into my groove,” he said. His “groove” included three projects with the CreateIT Collaboratory, a program where student teams work with clients on developing a prototype device. He worked with Tektronix on a modernized user interface for oscilloscopes, The Utah Ballroom Company on light up dance suits, and Texas Instruments on a device for sensing nearby objects. 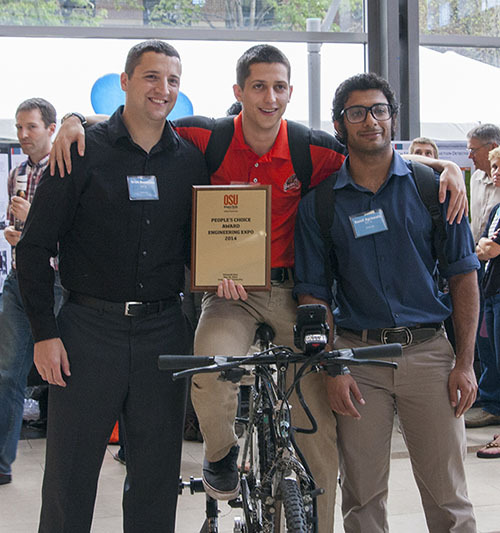 Culminating his undergraduate experience, his senior design project won the People’s Choice Award at the Engineering Expo. Benavidez with two friends created the “Intellicycle,” which could be added to any bike to measure speed, distance, cadence and temperature and send the data to a smartphone. The system also harvested energy from the front wheel to charge the phone and bike lights. Having faced the challenges of being an older non-traditional student, Benavidez wanted to do more to help other veterans at Oregon State succeed. He served as the president and vice president of the Veterans & Family Student Association (VFSA) on campus, to help veteran students create a sense of community. Inspired by his experience of receiving scholarships, Benavidez initiated the Allworth-Holcomb Memorial Scholarship Fund for outstanding veterans at Oregon State. Benavidez graduated June of 2014 and is working on a master’s degree in cyber intelligence studies through American Military University. Currently he is commissioned as a second lieutenant, and will be attending the Intelligence Officers Course with the U.S. Air Force.